The CPT Payment Analysis report is an Advanced Report that displays the CPT codes billed in a date range. Charges — The total amount charged for those CPT codes during the time range. E.g., if 99212 is used five times at $10 each, it will display $50. Collectible — The amount remaining money that can still be collected, otherwise known as Balance. Payments — The dollar amount of payments posted to that treatment code. Adjustments — The dollar amount of adjustments posted to that treatment code. % of Payments — The percentage of the Charges that has been paid, calculated as Payments divided by Charges. The information displayed in this report is similar to the information found on the Treatments by Provider report with the additional reporting of Top 5 CPT codes, percentage paid, and grouping for the practice as a whole rather than individual providers. This report can be printed and exported to an Excel spreadsheet. Class — The insurance type code, e.g. Medicare Part B. Charges - Amount — The total amount of all charges for that CPT code. Charges - Count — The total number of times that CPT code was used for that insurance type. Primary Insurance - Amount — The total amount of primary insurance payments to that CPT code for that insurance type. Primary Insurance - Pct — The percentage of payments that were primary insurance payments. Patient Payments - Amount — The total amount of patient payments to that CPT code for that insurance type. 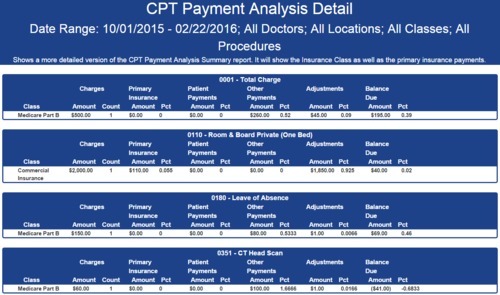 Patient Payments - Pct — The percentage of payments toward that CPT code which were patient payments. 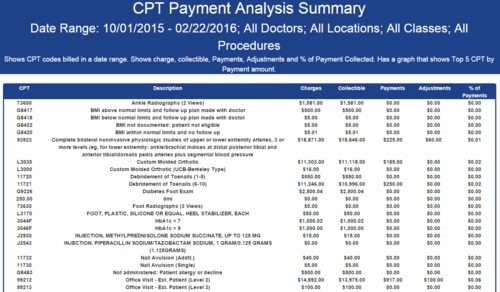 Other Payments - Amount — The total amount of payments toward a CPT that were secondary or tertiary insurance payments. Other Payments - Pct — The percentage of payments toward a CPT code that were secondary or tertiary insurance payments. Adjustments - Amount — The total amount of payments toward a CPT that were adjustments. Adjustments - Pct — The percentage of payments toward a CPT code that were adjustments. Balance Due - Amount — The amount remaining on that CPT code for that insurance type.